With his purported upcoming fight against an undefeated ring legend who made more money per minute (6 million plus) in his last fight than most aspiring pugilists could ever hope to make for their entire career, 31 year old Andre Berto (30-3 23 KO) comes into his bout with 38 year old all time great Floyd “Money” Mayweather (48-0 26 KO) as perhaps the greatest underdog in the history of the sport. And that’s definitely to take nothing away from Berto’s career accomplishments. Berto is a 3 time World Champion in the 147 Pound division, he has held the coveted WBC Welterweight title and defended it five times, against four former world champions in a span from 2008-2011 in which he was seen as a can’t miss future superstar of the division. Then along came another Mayweather opponent named Victor Ortiz who simply would not be denied his moment in the sun and shocked the world in early 2011 with a major upset of Berto for his world title. However, it did not take long for Berto to rise once again as a Phoenix from the ashes and defeat the highly regarded IBF 147 lb champion Jan Zaveck for his second world championship mere months later only to see injuries keep him out of the ring for the next 14 months. When Berto, the proud former 2 time champion of the world did return in late November of 2012 he simply was not the same fighter who once staked his lofty claim as one of the world’s top fighters as he was defeated soundly by a surging Robert Guerrero, ironically in a matchup to determine the next opponent for the incomparable Floyd Mayweather who had just inked a lucrative new deal with a new network in Showtime. Berto would only fight once in 2013, badly injuring his shoulder in a razor thin upset loss to popular perennial contender Jesus Sotto Karrass before heavily contemplating retirement after undergoing major reconstructive shoulder surgery after that fight. What with 10 million dollars plus in the bank and two major World titles won no one would have blamed Andre Berto for hanging up his gloves and retiring to a life of hard earned luxury. But you see, Berto is not a man built to quit or resign himself to the fate of the timid or weak hearted, just like in his fights he has certainly been knocked down in life, but he always pulls himself back up to his feet and after a triumphant return to the ring in 2014, Berto made the most of his fourth opportunity at a world title, afforded to him by Paul Haymons PBC platform and he looked like his old self, only better in decisively blasting out the durable top contender Josesito Lopez in 6 rounds to claim a third Welterweight world title and earn a coveted shot at an exiting Mayweather in the process. So come September 12, Berto will not be fazed or intimidated by the magnitude of the moment and he will be ever ready to perform as Champions do on the grandest sporting stage in the world against the world’s top athlete that day, and if in his final fight the 38 year old Floyd Mayweather Jr. should take Andre Berto lightly or drop his guard for one fleeting second we may be hearing “And New!! 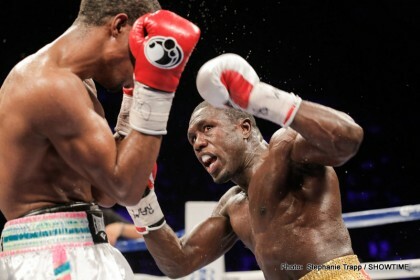 !” Welterweight champion of the world Andre Berto.